The Artist working on Pennsylvania Avenue from the Treasury Steps in the Early 1890's, a commission by B.F. Saul for the Chevy Chase Bank Headquarters in Bethesda, Maryland. The artist at 6 Rue Hermel in Paris, XVIII 1962. Frank Wright lived in France for three years while painting and studying printmaking at Stanley William Hayter's celebrated Atelier 17. Shop, The F Street Flower Shop and George's Radio and TV. Wright's former studio is now in the center of the popular, new International Spy Museum, housing the Emile Zola Restaurant. 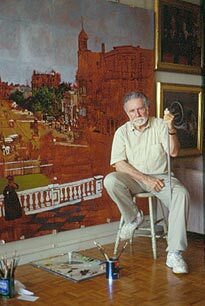 The artist in his studio in front of the five panel Ninth Street Painting, much of which was done from life in the late 1970s. The artist and his wife in Montmartre in 1962 at the celebrated Place du Tertre adjacent to the Church of Sacre-Coeur. Montmartre and Montparnasse were the chief areas of artists studios. B.A. American University, Washington, DC, 1954. M.A. University of Illinois, Urbana, 1960. Postgraduate work in art history, Fogg Museum, Harvard, 1960-1961. Studies and research, Berenson Villa i Tatti, Florence, 1956-1958. Studies and Research, L.J. Rosenwald Collection of the National Gallery of Art, 1959-1960. Studies in etching and engraving at Stanley William Hayter's Atelier 17, Paris, 1961-1964. National Society of Arts and Letters, Gertrude Vanderbilt Whitney Scholarship, 1950-1954. Elizabeth Van Swinderin Award in Fine Arts, American University, 1954. Leopold Schepp Foundation Fellowship for European study, 1956-1958. Print Council of America, Paul J. Sachs Fellowship in Graphic Arts, 1959-1962. Omicron Delta Kappa Honor Society (Beta Circle), 1998. FRANK WRIGHT: PAINTINGS, PRINTS & DRAWINGS, Mickelson Gallery, Washington, DC, May 5-June 4, 1965. This was Wright's first commercial gallery exhibition. FRANK WRIGHT, Gallery Marc, Washington, DC, June 1-30, 1971. FRANK WRIGHT: PAINTINGS, PRINTS, DRAWINGS, Adams, Davidson Galleries, Washington, DC, May 6-June 7, 1975. PAINTINGS BY FRANK WRIGHT, Kennedy Galleries, New York, March 3-20, 1981. FRANK WRIGHT: ETCHINGS AND ENGRAVINGS, Kennedy Graphics, New York, March 3-20, 1981. FRANK WRIGHT: PAINTINGS 1968-1980, Corcoran Gallery of Art, Washington, DC, June 13-July 19, 1981. FRANK WRIGHT: PAINTINGS 1975-1983, The Dimock Gallery, The George Washington University, Washington, DC, March 3-30, 1983. FRANK WRIGHT, WASHINGTON PAST AND PRESENT, International Monetary Fund Visitor's Center, Washington, DC, November 19-December 12, 1986. CITY OF MAGNIFICENT DISTANCES, The Nation's Capital, Library of Congress, October 17, 1991-March 15, 1992. FRANK WRIGHT: PAINTINGS, Covington and Burling, Washington, DC, September 10-October 1992. FRANK WRIGHT: PAINTINGS, Susquehanna Art Museum, Harrisburg, Pennsylvania, July 1-September 6, 1993. CONTEMPORARY SELF-PORTRAITS FROM THE JAMES GOODE COLLECTION, The National Portrait Gallery, July 30-December 5, 1993. FRANK WRIGHT: PAINTINGS AND PRINTS 1963-1998, Strathmore Hall, Rockville, MD, August 28-October 3, 1998. FRANK WRIGHT: ANNAPOLIS AND THE BAY, PAINTINGS 1989-1996, Maryland Hall for the Creative Arts, Annapolis, MD, September 11-October 17, 1998. FRANK WRIGHT: DEEP-BITE ETCHINGS AND PLATES, The Cosmos Club, Washington, DC, September 1998. FRANK WRIGHT (WHERE IT BEGAN) & JOHN PATRICK CAMPBELL (AT THE BEGINNING), Mickelson Gallery, April 12-May 29, 1999. OBSERVATION AND CIRCUMSTANCE: THE PAINTINGS OF FRANK WRIGHT, John Deckert, Arts Magazine, March 1981. FRANK WRIGHT PAINTINGS: 1968-1980, David Tannous, Catalogue, Corcoran Gallery of Art, Washington, DC, June 13-July 19, 1981. DISCOVERED!, Jo Ann Lewis, The Washington Post Magazine, June 21, 1981. FRANK WRIGHT"S OWN WAY, Benjamin Forgey, The Washington Star, June 21, 1981. FRANK WRIGHT: AN ARTIST WITH A SENSE OF HISTORY, Jill Weschler, American Artist, September 1982, (cover article). Wright Side of Town, WUSA-TV Channel Nine Capital Edition, Sunday, June 29, 1986. FRANK WRIGHT: AN ARTIST IMMORTALIZING THE MOMENT, Patricia E. Keegan, Survivors Guide to Washington, August 1986, (cover article). PAINTING THE TOWN, Barbara Gamarekian, The New York Times, November 29, 1986. D.C. ARTIST IS HISTORIAN WITH PAINTBRUSH, Ruth Palombo, The Chevy Chase Gazette, December 21, 1989. FRANK WRIGHT, ARTIST AND TEACHER, Montgomery Community Television, Art Strokes, March 1, 1990.